In the last couple of weeks, we have worked hard to optimise our system to keep up with the increased demand for Datamolino. We are also thinking hard about our users, so even when we are working on the "invisible parts" of Datamolino, we try to squeeze in features that will help you to be more effective. You can now forward your HTML receipts to Datamolino, we will create a PDF from your email receipt. Because we create a PDF, this allows us to upload the resulting file to your accounting system if file attachments are supported (Xero). How do we process your emails now? If an email contains a PDF file, only the PDF will be processed. If an email does not contain a file attachment, Datamolino will create a PDF from the content that is marked as <html>. This will strip the email of unnecessary information that accumulates if the email was forwarded. In most cases this allows us to create a PDF that will appear consistent every time. DTMLN FILE NAME: the file name as the file is saved in your folder. Datamolino renames the files if we split the original file into multiple transactions. 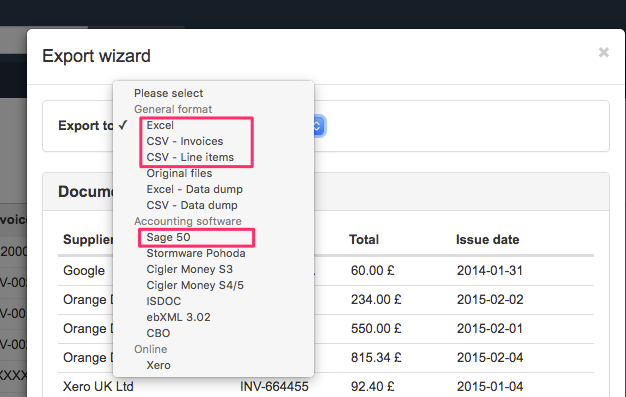 We have implemented the Sage "Audit Trail Transactions" template as found in the Sage documentation here. You still need to amend some data into the columns manually in a spreadsheet program. The decimal separator is " ." and in the CSV files the column separator is ";". When you open the files in Excel it depends on your regional settings. For some users, numbers with decimal separator "." show as "text". In this case, it is easiest to select the column and do a find and replace from dot "." to a comma ",". 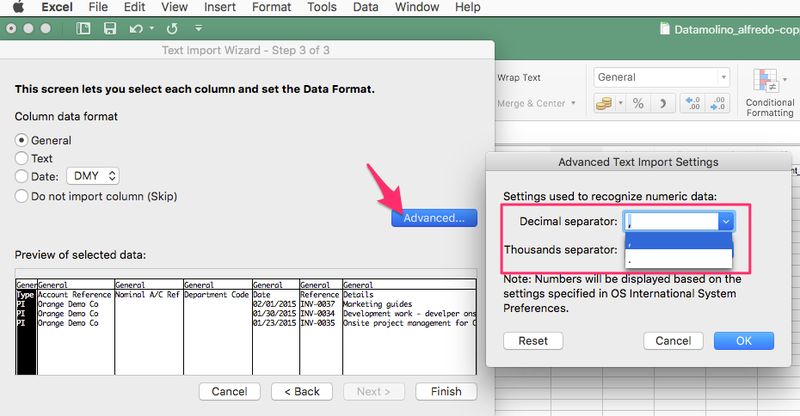 When importing a CSV to Excel it is also possible to define the decimal separator. (see screenshots).